President Bush outlined five new initiatives Tuesday to help Afghanistan continue to move toward peace and prosperity so that it never again is a "terrorist factory." "My government reaffirms its ironclad commitment to help Afghanistan succeed and prosper," said Mr. Bush, standing in the Rose Garden next to Afghan President Hamid Karzai. "Security is essential to steady progress and growth," Mr. Bush said. "The forces of many nations are working hard with Afghans to find and defeat Taliban remnants and eliminate al Qaeda terrorists." Mr. Bush said the United States, which in recent months has increased its force in Afghanistan to about 20,000 troops, is helping to build the new Afghan national army and train new Afghan police and border patrol. Moreover, Mr. Bush said the United States is: helping foster democracy by training newly elected politicians, expanding culture and education exchange programs, pursing bilateral trade and investment; working to print new textbooks and build schools for both boys and girls, and is providing small business grants to women. "Coalition forces, including many brave Afghans, have brought America, Afghanistan and the free world its first victory in the war on terror," Mr. Bush said. "Afghanistan is no longer a terrorist factory sending thousands of killers into the world." Karzai said that in his meeting with members of Congress, "I thanked America for the help that it gave us to liberate ourselves and rebuild ourselves and prosper. That help has been the source of all growth in the past two years." Meeting with Defense Secretary Donald Rumsfeld on Monday, Karzai indicated that the U.S. was doing enough, but that NATO forces — currently confined only to the capital Kabul — could offer more help. 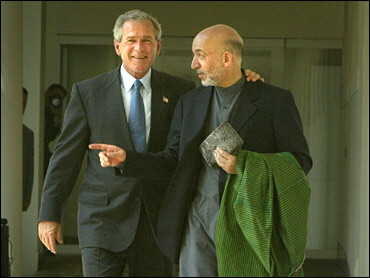 Karzai on Tuesday denied that he's made any political pacts with former Islamic militant leaders. "No deals have been made," Karzai said, adding that, as president, he needs to talk with Afghans from all backgrounds to assure peaceful, democratic elections. "No coalitions have been made. No coalitions will be made." In his 20-minute speech to members of the House and Senate gathered in the House chamber, Karzai touted the end of a long period of "oppression and terror," but added that there is "a long road ahead." The chief obstacle in that road is violence, which continues and may even be intensifying as elections approach. On Tuesday, Afghan troops killed four suspected Taliban militants and captured two more in a gunfight at a checkpoint in southern Afghanistan, a senior official said Tuesday. The victims were in a pickup truck that failed to stop late Monday at the checkpoint in the Hazar Boosth area of Zabul province, 190 miles southwest of the capital, Kabul, Gov. Jan Mohammed Khan said. A day earlier, a Chinese military plane left the Afghan capital with the bodies of 11 Chinese construction workers slain in their sleep in northern Afghanistan last week. Afghan officials say they have arrested 10 people in connection with the attack, but it remains unclear whether Taliban-led insurgents battling U.S.-led forces in the south and east were responsible. Nearly 500 people have died in violence across the country so far this year. Many are victims of the stubborn Taliban-led insurgency. Others have died in factional fighting linked to the country's booming drug trade. A senior U.S. military official says the coalition stands "firmly behind the decision" to hold elections in Afghanistan in September — despite violence aimed at stopping them. The military says plans being drawn up by foreign troops, the United Nations and Afghan leaders will encourage voter registration by increasing security. The U.N. says nearly a third of the Afghans eligible to vote are registered. Across the border in Pakistan, authorities are trying to identify some of the scores of bodies of militants killed in a counterterrorism operation near the Afghan border to determine if any were key al Qaeda members, officials said Tuesday. The five-day offensive in South Waziristan, about 210 miles west of the capital, Islamabad, ended Sunday after an assault on militant hideouts with artillery, helicopter gunships and jet fighters. At least 72 people, including 17 security forces, were killed. Pakistan has deployed about 70,000 troops in its tribal regions to prevent Taliban and al Qaeda rebels from sneaking into Pakistan from Afghanistan.